The Pharisees and Sadducees were the biggest religious hypocrites in Christ Jesus’ day, which was the reason why the Lord taught that these religious leaders’ outward religiosity was thoroughly fruitless, phony, and narcissistic. For these reasons, He warned His disciples to beware of the Pharisees and Sadducees’ leaven (their venomous attitudes), and why He advised His disciples to avoid judging other people with the same kind of hypocritical righteousness the Pharisees and Sadducees used. For the record, the Pharisees were strict observers of the Written Law or Torah, as well as strict observers of the Oral Law. They adopted the “traditions of elders”—the interpretations of the Oral Law (unwritten laws) they claimed had been handed down from Moses. However, by placing more emphasis on the “traditions of elders,” the Pharisees made God’s written commands of no effect. Even though the Pharisees explained/taught the Law of Moses and enforced a strict adherence to said Law, they usually didn’t practice what they taught and enforced. Furthermore, they were nitpickers, but ONLY about SOME commandments; they actually ignored following many of God’s commandments, as well as many of the laws they themselves added. Because they were full of spiritual pride, they demanded to be greeted in public as Rabbi, Master, and/or Father, and they expected to be shown the proper respect. Then too, their deeds were constantly on display; they had a habit of praying, fasting, and giving alms in public, because they loved to be seen of men. They made sure that their phony religiosity and man-given honorable titles impressed the people watching them so that they (the Pharisees) could make money off of their religion, as well as receive praise. In contrast, the Sadducees believed in a strict literal interpretation of the Written Law or Torah, which was to them without any influence from their contemporary society or the Oral Law (unwritten laws) that had been handed down. Their main concern was maintaining the integrity of the Mosaic Law. They insisted that the Torah, the Law of Moses found in the Pentateuch (first five books of the Old Testament), was binding. The Sadducees believed that the oral regulations based on “tradition” misrepresented the Torah, and this is why they rejected the “traditions of elders.” They also didn’t believe in the resurrection of the dead, nor in angles or demons. Moreover, because they didn’t believe in Judgment, Heaven, or Hell (denied the afterlife and the immortality of the soul), they also did not believe in rewards or punishments at judgment day. The taught external cleanliness (modesty; clean clothing), but they didn’t teach about inward holiness or obedience to God. They were rationalistic and worldly minded, heavily influenced by Greek customs and culture, and were in favor of adopting them. They accepted human reasoning over Divine Revelation, believing that if they couldn’t conceive or comprehend something, then that “something” could not exist. Although they believed in God, they denied the supernatural. Lastly, they didn’t believe in God’s involvement in everyday life. In fact, the Sadducees were exceedingly self-reliant. Even though the Pharisees are the ones who consistently are given a bad rap, the truth is that the Pharisees and Sadducees in Christ Jesus’ day were spiritually proud religious hypocrites, legalists, murders, and militants. Both groups/sects also were involved in political scheming. What is important to note here, however, is that the leaven Christ Jesus tells His disciples to watch out for refers primarily to the Pharisees and Sadducees’ spiritual pride and religious hypocrisy, which Christ Jesus teaches God never rewards. Metaphorically speaking, Christ Jesus is saying that the leaven in Pharisees and Sadducees’ unregenerate inner spirit or heart has the same internal and external altering effects as does the little amount of yeast that is put inside a portion of bread dough. In other words, both the Pharisees and Sadducees’ sufficient amount of toxic attitudes in their individual spirit/heart and the accurate measure of yeast in bread dough modify internal and external characteristics as they spread or rise. Bottom line: The Lord is saying that sooner or later the Pharisees and Sadducees’ leaven (spiritual pride and religious hypocrisy) will spread from the inside – out, causing internal emotional, moral, and spiritual changes and external physical alterations to the people in their Jewish Temple community. For the purpose of being very clear, let’s mix metaphors. 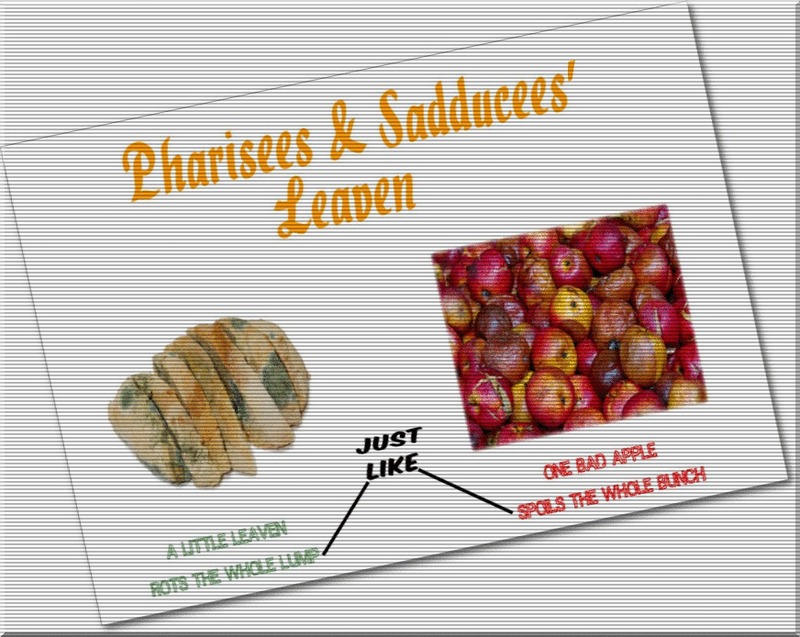 Pharisaical and Sadducean leaven is a rotten apple. That is to say, malicious leaven during the process of fermentation has the same internal and external poisonous effect on an infected person and the region of people he or she pollutes, as does the internal and external decomposing effect the overripe apple during the ripening process has on itself and the other apples around it. In the case of the one bad apple that spoils the whole bunch, the riper apple gives off a higher level of ethylene, which is both a natural gaseous hormone and a ripening agent. It is the ethylene from the overripe apple that speeds up the ripening process in the other apples around it, and eventually rots them. Additionally, an apple that is infested with mold also will contaminate the other apples (or the different fruit) it is stored with, because the mold on the infected fruit spreads to more food sources, ruining or rotting them as well. Likewise, this same rotting principle is true of the Pharisees and Sadducees’ leaven. Just like one bad apple most definitely will contaminate the other apples its around and ultimately cause their premature rotting, the Pharisees and Sadducees’ leaven (spiritual pride and religious hypocrisy) also will corrupt everyone with whom their leaven comes in contact. Today, as it was in Christ Jesus’ day, the Pharisees and Sadducees’ cancerous leaven (spiritual pride and religious hypocrisy) pertains to both our natural and spiritual lives. In the natural realm, the Pharisees and Sadducees’ malicious leaven represents the destructive power one person’s contaminative influence can have on his or her own natural developmental process—mental and physical maturities—as well as on other individuals’ natural developmental process. Likewise, in the spiritual realm, the Pharisees and Sadducees’ malicious leaven signifies the destructive power one spiritually unrighteous, unholy person can have over his or her own eternal life status and spiritual growth, as well as over other people’s eternal life status and spiritual growth. Finally, the main thing to remember is that a spiritually proud religious hypocrite who is in the process of spiritually, emotionally, morally, and physically decaying his or her own life, both internally and externally, absolutely can emotionally, physically, morally, and spiritually decay the internal character traits and external behaviors of the people who are around him or her. For this reason, a spiritually proud religious hypocrite is a dangerous enemy to the Household of Faith children who are in the Kingdom of God on Earth, because a spiritually proud religious hypocrite swiftly contaminates the inward emotions and attitudes of others. Additionally, a spiritually proud religious hypocrite’s behaviors always dishonors, disrespects, and diminishes the “much good” that genuinely holy and righteous people do. For these reasons, believers today still need to watch out for the Pharisees and Sadducees’ leaven, for it rots within and affects without. AMEN.